Not all kitchen knives in the market are durable. Purchasing a well-known brand doesn’t guarantee you the right quality. Some companies sell their 2nd or 3rd line product brand at a higher price hoping the brand name will make them sell more. In this article, you will find the top 10 best kitchen knife sets on the market. The list is narrowed down based on the kitchen knife set reviews from actual customers. Henckels international Silvercap 14pc block set was designed to offer high-quality services and low maintenance knives to chefs to carry out their daily tasks. This knife block is very user-friendly and can be used to carry a variety of functions. What makes this kitchen set unique? Once you buy this set, you don’t need to sharpen the blades due to their handy micro-serrated edge. When preparing your meal, you can use the 8” Chef’s Knife to dice the onions or chop the herbs, use the 5” serrated utility knife to cut tomatoes while the 5” Hollow edge Santoku can be used to prevent your food from sticking. These kitchen knife sets are made of stainless steel material and constructed using a single-piece precision stamped method to enhance the durability of the blades. The triple riveted handle provides a balance between the handle and the blade when chopping. This makes you feel comfortable and at ease when using these blades. They have a stylish logo-stamped endcap which is strongly and solidly built. Its lightweight feature helps you yield maximum maneuverability when using the knife. The weight of a single block set is 7.1 pounds making them very light. 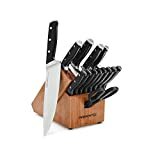 The 14 piece block set consist of 3″ Paring knife, 4″ Paring knife, 5″ Serrated Utility, 5″ Hollow Edge Santoku, 8″ Bread, 8″ Chef, 6 – 4.5″ Steak Knives, Kitchen Shears and 13-Slot Black Hardwood Block. The stainless steel endcap makes them look classy, I’m sure you will want to show the silver cap. Made of a high-quality stainless steel blade. Designed with a micro-serrated edge. You don’t need to sharpen the blades. Ease of use and comfort when using the knives. Equip your kitchen with this high-quality, durable and value driven product and you will never go wrong in your kitchen. Henckels International makes high-quality kitchen tools that meet almost every chef needs. This Chicago Cutlery Belden knife meets your kitchen demands. You can use the knives to slice, dice or chopping items. 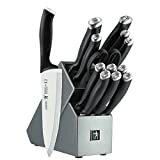 The 15-pieces kitchen knife set consists of 8” chef knife, 8” slicer knife, 3” peeler knife, 4” paring knife, 8” bread knife, 5.5” utility knife, (6) 4.5” steak knives, (2) 4” paring knives and kitchen shears. The blades are made up of professional high-carbon stainless steel material that makes them hard and resistant to rust. Designed using forged construction technique leading to increased balance, control, and stable blades. This kitchen set is suitable for those who are looking for fully forged kitchen assortments. The full metal tang feature adds to the durability of the knives and ensures there is a balance between the handle and blade. The metal tang makes the knife feel comfortable when gripping with your hands. These knives not only offer weight balance but also offer finger protection. The Belden series has a curved handle and angled bolster which can have a great impact on your kitchen counter. The knives have a contemporary styling making them look more attractive. The 8-inch chef knife can be used for multipurpose activities like chopping, slicing and dicing every ingredient. 5.5 inch is used for cutting general ingredients whereas the 4-inch knife is suitable for peeling fruits and vegetables. The stainless steel material ensures construction of strong blades to resist rust and stains. Ease of use when cutting and chopping items. An exclusive taper grind edge. The knives are of high quality with attractive design and excellent value. Knives are easily stored in a cherry wood block that adds to the decoration of your kitchen. You can easily wash with your hands. Chicago Cutlery Belden block knives are sharp and easy to handle. If you’re looking for kitchen knife sets which are heavy (have a weight of 9.7 pounds) and well balanced, then this is the set to go for. No need to sharpen the knives. This is a kitchen knife set block with SharpIn technology to ensure the knives are always sharp for a long time. The wooden block is fitted with an integrated stainless steel sharpener. Built-in ceramic sharpener automatically sharpens your blade edges every time you remove and return the knife to the stainless steel storage block. You don’t have to waste your energy in trying to sharpen the knives because the integrated sharpener will automatically do that for you. Only kitchen knife sets with straight cutting edges should be stored into the slots integrated with sharpeners. Knives with serrated edges should be store on other slots of the block. Made of forged high carbon no-stain steel for durability in everyday use of kitchen knife and resist rust. The stainless steel design makes them look more attractive in the kitchen space. The premium knife construction adopts the modern style. The block set feature a full tang construction design and a balanced knife handle to increase the comfort of cutting and slicing items. The full tang construction ensures the knives are of excellent strength. These kitchen knife sets are well labeled making it easy for you to pull the right knife for slicing, dicing or cutting task. The Calphalon knife set has a wide selection of small and large knives for different tasks in your kitchen. Their ergonomic design handle increases comfort while reducing hand fatigue for better cutting and slicing of items. The cutlery set features a contoured handle which increases grip in your hands. To increase the durability of the knife, the handle is triple-riveted into a single piece of steel design. Each block set of Calphalon classic self-sharpening knives consist of 8-inch chef’s knife, 8-inch bread knife, 6-inch utility knife 7-inch Santoku, 3.5-inch Paring knife, 8 steak knives, kitchen shears and Knife Sharpening wood block. They have a built-in ceramic sharpener. The knives stay sharp for a lifetime, no need to sharpen them. All knives are well labeled for easy identification and storage in the wooden block set. Designed using the forged technique with high carbon no-stain steel to resist stains and discoloration. They have a comfortable grip handle. The Calphalon classic self-sharpening set ensures your kitchen knives are operating at peak performance as well as offer a versatile array of knives for different tasks. The knives are very sharp so be careful when using these kitchen knives sets in your kitchen. If the knife is falling down, do not try to catch it up. You should wash your hands and never soak this cutlery set otherwise you will void the warranty. 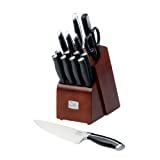 Amazon released a new set of premium 18-pc cutlery knife block which is booming in the market. Being an Amazon product, it has benefits over the other cutlery kitchen knife sets products being sold on Amazon. The knife set with a block provides you with everything you need to make a delicious meal for your family. 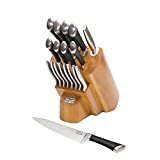 The 18 piece set features an 8-inch chef’s knife, 8-inch slicer knife, 8-inch bread knife, a 5.5-inch utility knife, a 3.5-inch spear-tip paring knife, 6–inch boning knife, eight 4.5-inch steak knives, a 8–inch kitchen shear, 7–inch Santoku knife, 8–inch sharpening rod and a wooden knife block. This set of AmazonBasics features blades stamped from stainless steel. Although the stainless steel material makes the blades rust resistant, the manufacturers warn on putting the knives in the dishwasher. Although they’re cheap compared to other knife sets, the knives are made of professional quality stainless steel material. The knives have precision-honed blades making them long lasting with reliable performance. The blade sharpener is used to maintain sharp edges on all the knives except on the steak knives. Steak knives have micro-serrated edges which do not require any sharpening. The knives are fitted with a triple-riveted handle to provide a comfortable grip. A full bolster keeps your fingers safe with some distance from the blade. Each triple-riveted handle is constructed with a full tang for excellent strength. The ergonomically shaped polypropylene provides extra durability to the knives and also increase the strength. Blades are made of the top quality stainless steel material making them more durable and also be able to withstand the pressure of regular sharpening of the blade. The material also makes the knives resistant to rust and staining. The stainless steel smooth surface also makes cleaning easy. The knives are weighted so as to ensure maximum control as well as ensure there is a balance when using the knife. The knives are sturdy making it easy for you to handle the knife as well as have maximum control over what you’re cutting. The metal bolsters help in good weight distribution on your fingers as well as finger protection. The ergonomic handle helps you cut things with ease and are comfortable to hold. They come in an attractive wooden block for holding the knife set. The wooden block can complement your kitchen design. Versatile knives (18 pieces to choose from) to comfortably meet all your kitchen demands. Fine-edged blades with retained sharpness and long-lasting. The Amazonbasic premium knife block set is excellent and affordable for all your kitchen needs. They help in increasing kitchen efficiency. The knives are slightly heavy so be warned if you like using light knives. The set is hand wash only. This is a 7 piece stainless steel cutlery kitchen knife set designed by HomeHero Company. The set comes with a professional knife sharpener and a stand making it the most comprehensive set on the market. The professional knife set has five different types of stainless steel knives, a sharpener, a safety finger guard to protect your fingers and also a cutlery elegant acrylic stand. The sharpener can be used in two modes (fine and coarse sharpening). The acrylic stand has a modern design doubling as a decoration for your kitchen. The knife set consists of a chef’s knife, bread knife, carving knife, utility knife, and paring knife. The knife stand keeps your knives in an orderly manner while the acrylic stand with a reflective black veneer prevents damage to your knives. You can place the stand on any flat surface thanks to its non-slip rubber feet. All the knives are made of stainless steel material and a laser finishing so as to have a smooth clear blade. High-quality stainless steel makes the blade hard and strong to carry normal meal preparation activities. The blades are also coated with non-stick coating paint. Non-stick coating painting prevents food from adhering to the knife and also ensure the food taste is not altered. The knives are also rust resistant due to the stainless steel material used in building the knives. The cutlery sharpener has a V-grip base to prevent from slipping when placed on the kitchen counter. Carbide blades provide a quick edge setting capabilities whereas the ceramic rods are used to provide a fine hone edging. Ergonomically designed handles for comfort when using. The knives have an elegant design and smooth finishing. They have an elegant acrylic stand which is a modern design adding a touch of sleekness to your kitchen. This brand is the most comprehensive knife set on the market. The knives are suitable for professional chefs and amateurs. 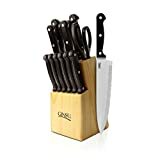 These kitchen knife sets stand out as compared to other products sold on Amazon. It lets you prepare food like a pro with the best quality. The kitchen set has 8–inch Chef knife, 8–inch Bread knife, a 5–inch utility knife, a 3.5–inch paring knife, six 4.5–inch steak knives, scissors, a sharpener, and a stand. This set of knives is equipped with the most popular food preparation knives with six pieces of a steak knife and a kitchen scissors at an affordable price. These kitchen knife sets are constructed using high-quality stainless steel material which makes them more durable, strong and resistant to rust. The premium stainless steel metal will not tarnish, corrode or even rust. All the blades are made of heavy duty restaurant grade metal to meet the demands of home and commercial usage. The sharpener tool ensures you maintain sharp edges with all your knives. The knives are also perfectly honed to help you cut foods with ease. Mores, they have a classic lightweight that makes them easy to handle and maintain. The tapered handle fits perfectly in your hand thus they feel more comfortable when you’re cutting, slicing or chopping fruits. More stylish with modern design. The acrylic stand can enhance the appearance of your kitchen counter. Ergonomic feature on the knife handle gives you more control over the knives. It also makes you feel comfortable when using the knives. Very strong; you don’t have to worry about the knife cracking, breaking or coming apart. If you’re looking for a perfect gift to gift your loved ones during weddings or anniversaries, then this Super Sharp stainless steel can come to your rescue. The professional glass knife block box looks so nice on your kitchen counter. Chicago Cutlery knives are well known for professional quality, sharpness, outstanding durability and Belmont 16 piece is not exceptional. The Belmont stainless steel knives are stylish, strong and more comfortable to use. The Belmont block set can easily blend with your kitchen décor. The storage stand is made of espresso wood block with a dual material handle making it more attractive and you will be proud to display the wooden block at your kitchen counter. 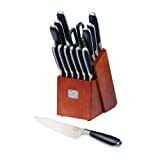 The Chicago Cutlery kitchen knife sets are known for the outstanding quality, durability and precision sharpness. The Belmont block knife set has stainless steel blades which can withstand stains and rust. The incorporated sharpening tool helps keep the knives sharp. Using this Belmont set, you will never go wrong in your kitchen. It makes you enjoy preparing meals for your family with a variety of knives you can choose from. The block set has the most common knives used in every kitchen. They include; 7.75 Inch Chef Knife, 8 Inch Bread Knife, a 5 Inch Utility Knife, a 3.5 Inch Paring Knife, 3 Inch Peeler Knife, eight 4.5-Inch Steak Knives, Kitchen Shears, Sharpening Steel and Espresso Wood Block. Very attractive espresso wood block to decorate your kitchen. They have a comfort grip with a thick polymer handle to make cutting effortless. Sharpening steel keeps your knives very sharp over time. A variety of knives which can perform versatile functions. Dual material that makes you feel proud when you’re using them and looking appealing at your kitchen counter. The knives may feel heavy in your hands. They have a weight of 8.8 pounds. Insignia steel knife set is a professional cutting tool that helps in efficient food preparations. They have a satin finish making them more pleasing to the eyes. This 18-piece cutlery consists of 3 inch peeler knife, 3.5-inch paring knives, 6–inch boning knife, 5-inch utility knife, 8–inch serrated bread knife, 8–inch slicer knife, 8–inch chef’s knife, eight 4.5-inch steak knives, 7–inch Santoku, shear, a wood block and an in-block sharpener. They are made of forged designed which helps to increase the weight and balance in your hands when you hold them. The contoured stainless steel handle makes them sleek and more comfortable in the hands. Forged bolster prevents your fingers from running up the blade. Their satin finish makes the blades more pleasing to both the eyes and the hands. Its ergonomic handle makes it more comfortable at hands with sleek styling. 17-slot wood block ensures the knives are safely stored. The built-in block sharpener keeps the knives sharp with a taper grind edges which ensures there are great knife performance and optimum sharpness for cutting, dicing and slicing items. Blades are made of high carbon stainless steel material which makes them strong, hard, stain and rust resistant. A full metal tang adds more strength and control of the blade as it runs from the tip of the blade up to the end of the knife. They are very sharp for cutting meat, peeling fruits, veggies with ease. Very comfortable at hands. They have a balanced handle and blade grip. Very attractive when placed on kitchen counters. The stainless sleek design makes them more pleasing. A variety of pieces to choose from for your daily meal preparations. The knives are sharp with a variety to get the job done. They have a hollow handle making them weigh less and fits nicely in your hands. Hand washing is recommended for this knife set. This 18 piece block kitchen knife set is a perfect blend of all your culinary skills with precision performance. They have a professional stainless steel forged blades with black handles. These knives are perfect for daily tasks. They have a professional fusion collection set including a 3.25-inch paring, 3 inch peeling knife, 5 inch utility knife, eight 4.5–inch stainless steel steak knives, 7.75–inch chef, 8-inch slicer, 7.75-inch bread, 5–inch Partoku knife, 7–inch santoku knife, 8–inch stainless sharpening steel, stainless faceplate and poly slot inserts in bamboo stained pinewood block. The blades are made of durable high carbon stainless steel metal with forged design to withstand rust and stain resistant. This makes the blades harder and strong. At the end of the handle, they are fitted with stainless steel plates to convey a sleek contemporary design. The steak knife has a smooth edge as compared to other types of knives. A black non-slip poly grip at the handle allows for a sturdy grip increasing more comfort when handling the knives. To maintain the sharpness of the knives, a taper grind edge technology is used to ensure optimum sharpness when cutting and slicing items. This makes it easy to re-sharpen your knives. Attractive pinewood for storage of your knives on the kitchen counter. The bamboo stained pinewood block complements your kitchen design. Balanced and comfortable handles with soft grip. They have superb weight and strength making them more comfortable to control. This set of knives has great weight and you will love the large handle with soft grips. The feature at the end of the handle makes it more comfortable and you can slip your finger forward without being hurt. This cutlery set has simple black kitchen design knives in a natural wood block. Ginsu essential series knives are ever sharp, you don’t need to re-sharpen them hence no maintenance required. The serrated knife is scalloped designed to perform the toughest tasks in your kitchen. You will always have the best knife to use with ease for the toughest cutting jobs. The knives are ergonomically engineered to bring comfort and ensure your safety while using. The dual serrated edges avoid tearing food just like the other serrated knives do. An inclusive symmetric edge technology is integrated at each side of the blade to provide straight and even cuts. The stainless steel full tang makes them incredibly durable and strong. The full tang extends across the entire handle to provide balance. Triple-riveted handles ensure the handles do not peel off. The box consists of 8-inch Slicer, 8-inch Chef’s Knife, 5-inch Tomato Knife, 3.5-inch Paring, 5-inch Utility Knife, 5-inch Santoku Knife, six 4.5 inch Steak Knives, Kitchen Shears, and a classic natural Storage Block. The serrated blades help you have a straight and even cuts. They offer accurate and reliable performance. The knives are ever sharp and strong. They have a full tang and triple-riveted polymer handle that increases comfort and grip on hands. This set of knives are designed with the toughest task on the mind. Get a set of essential series knives and enjoy all the benefits they offer. Before buying any kitchen knife sets, you should get a sense of its fit. It should be able to feel comfortable in your hands. Look at your cooking habits and practices to determine which essential pieces that come with the set you want to buy. It should be able to inspire confidence in you. Look for these physical characteristics! Try a variety of them to find your ideal weight. Different people have different opinions on what weight to choose but choose a weight that feels right for you. Hold the knife in your hands to feel its grip. If it feels uncomfortable in your hands, then isn’t good for you. There should be a perfect balance between the blade and the handle to ensure you don’t use a lot of effort and the cutting of items is smooth. The chef’s knife is the most popular due to its versatile nature. A 10-inch knife can cut more volume though can be intimidating to you compared to 6 inches which can cut smaller volume but offers an element of agility. The material used in making the blade; carbon steel, stainless steel, high carbon stainless alloys or ceramic. How it is constructed. Do you need your blades constructed by forging, stamping or using the stock removal technique? The assembling of the blade is very important. Every chef knows that a good quality kitchen knife set is essential for their work. This article listed the 10 best kitchen knife sets based on reviews provided by customers who have used them. The list consists of quality sets for daily family cooks as well as top end blades. The compared different quality material, size, and durability among other factors you have to consider when buying a set of kitchen knives.